Antoinette Concha from Taos and Jemez Pueblos, is the daughter of the well-known Alma Concha. Antoinette has a delicate touch. Her figures are identically clothed in elegant white colors. The faces are uniformly brown. The facial features are limited to a prominent nose. The nose is a typical element in many Indian nativities. It is the symbol of a living being. The nose is a sign that earth has come alive in a human being. Similarly, the sameness of color, faces, and dresses reflects our common origin from the earth. 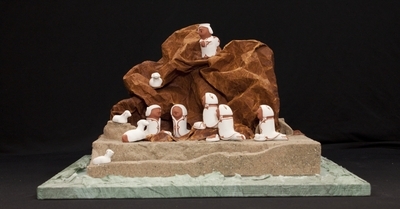 Glazed clay figures depicting the nativity of Jesus, sculpted in 1999 by Antoinette Concha in the United States. Exhibition label originally written by Fr. Johann G. Roten, S.M. for exhibit entitled "At The Manger" and held at Roesch Library, University of Dayton.